2016 Govecs GO! S2.6. Picture credits - Govecs. Submit more pictures. The GOVECS GO! S2.6 is equipped with a lithium battery. This leads into the incredible range of over 100 km. 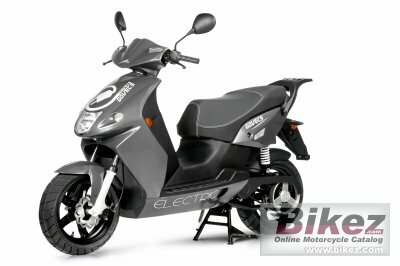 This model is still settled �50cc� comparable class. Due to the new battery management system, the cell balance has been optimized. The result is a longer lifetime of the complete battery pack. Comments: Lithium Polymer 72V 40 Ah battery. Charging time 5-6 hours. Approx. 2 hours to 80% charging. Approx. 1000 full recharging cycles. 72V/6 A, onboard charger, 110 � 240 V (50/60 Hz). Range 90-120 km. Ask questions Join the 16 Govecs GO! S2.6 discussion group or the general Govecs discussion group. Bikez has reestablished Bikez.info motorcycle web shop overview. Here we present the major online shopping possibilities for motorcycle parts, gear and accessories. This includes customizing and insurance. Search and compare products and prices. Try our 2016 Govecs GO! S2.6 discussion forum if you have questions or comments. Information about any technical issue is always welcome.